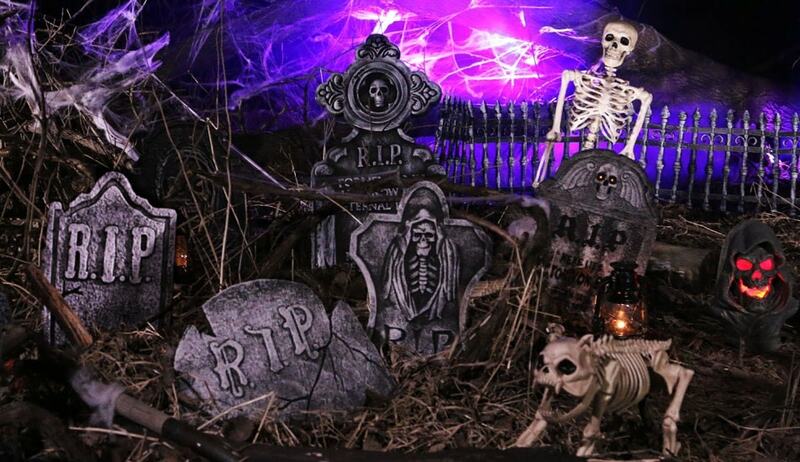 Now you have your Halloween costumes all sorted what about the decorations? At a guess this may for some people be the first item on the list, for others high end Halloween decorations are collected throughout the year. 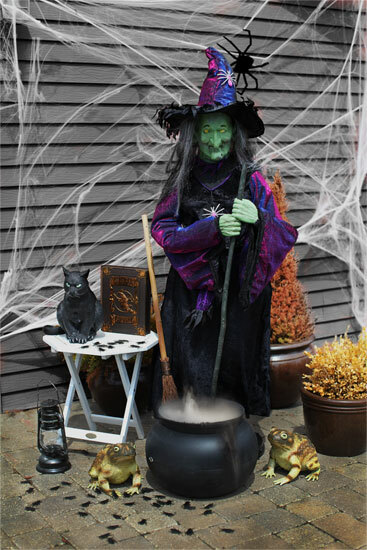 Then of course there are those of us who do prefer to wait until we have our theme worked out (for costumes that is) and then purchase a few decorations to match in, especially if we are doing a theme party for Hallows eve. There are literally thousands of ideas you can do for decorating your home inside and outside. So to give you some ideas we are showcasing some of our fav ideas from the super store Halloween Costumes. Yes they have everything you would need to create a stunning, jaw dropping decorative piece for everyone to enjoy. You can even buy these complete themes at Halloween Costumes, saving you time searching for every piece in the photos. 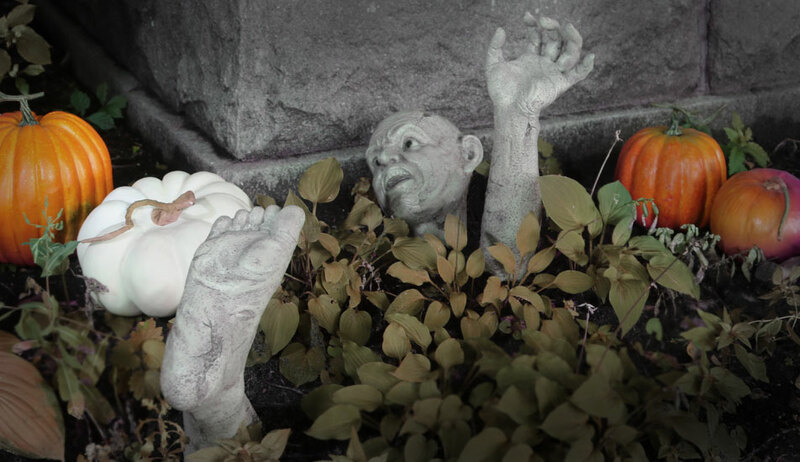 The haunted scene will turn your pretty green lawn and gorgeous flowers into an almost witch circa of 500 years ago. This super cool scene at night will give off that “scary” look. Not only will you have tombstones marking the final resting place of the dearly departed, you’ll actually have a skeleton popping out of the ground, along with his pet cat! You never know, those two just might be the next big internet lolcats craze. Love this one maybe the most but that’s because we love the whole purple look to it. Actually an extra you could do is hire a fog machine (or you can purchase one upon checkout, they show up), just for the night and have fog wafting through this scene. Would look SUPER cool especially with the purple eerie light in the background. Also if you happen to have a big tree, see if you can build the scene in front of that and have the LED light showing up into that tree as well, that would be spooky especially if the tree is near a street lamp. This complete scene has cracked tombstones, a skeleton that risers from the dead, with a dog that sits on his feet, however not cute, his dog has nasty sharp baring teeth! Mr Reapers his bust glows red like the fires of hell. The Zombie Take Over has Arrived! 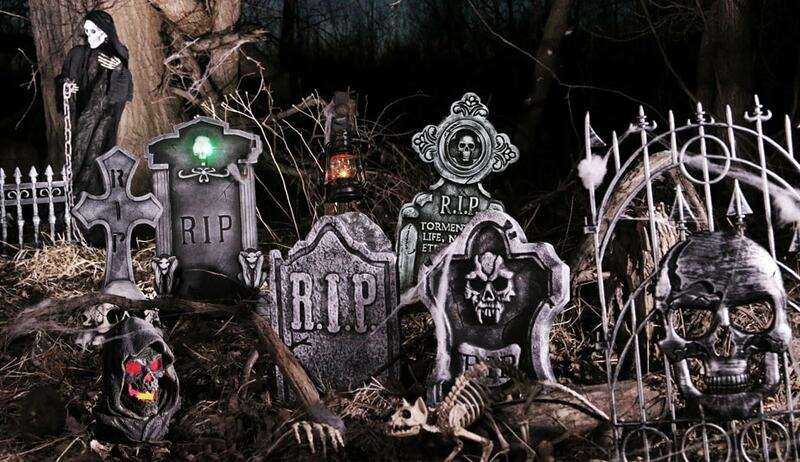 Are you having a Zombie themed party and just want a super easy entrance to your home? This is a terrific scene perfect to cover your front lawn! Grab a few of the complete scene sets to achieve the coverage you are looking for and to be honest a full lawn coverage would look epic! Now in the event you live in an apartment block or unit and you only have a small area to decorate whether it’s your front door or perhaps a balcony, the below two images will give you some great ideas. 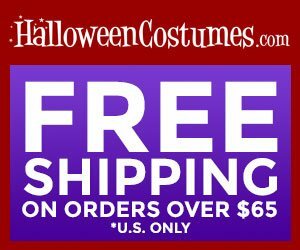 All sets of course can be purchased complete HERE at Halloween Costumes. Sliver and black always look a high end color combination and this particular scene uses the colors perfectly. In the foreground we see a bunch of pleasant and beautiful things (albeit a bit macabre). Now, those pumpkins are like no pumpkins we’ve ever seen! These are stylish, and if you’re not gravity impaired you could use it as a chess board. 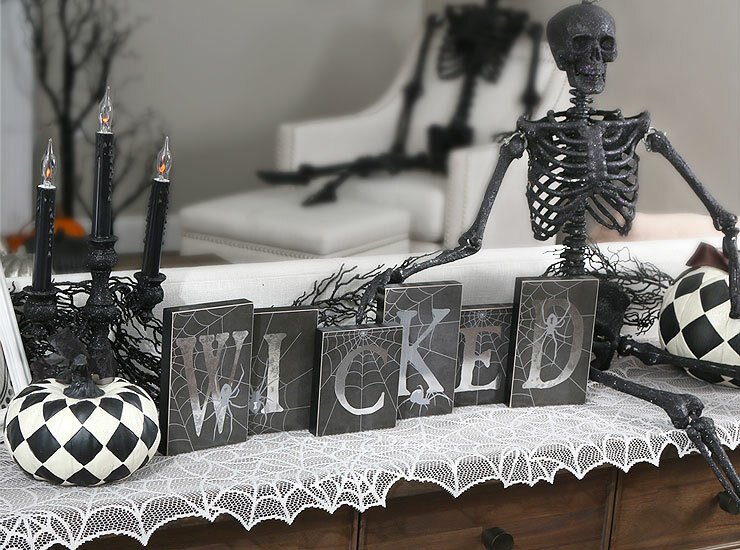 The wicked signs are rustic and that glitter skeleton looks as happy as a skeleton can look. In the background you can see another skeleton just lounging on what looks like a cloud (but might be a lounge chair to be honest). This is an ideal scene if you have a small room to decorate out or perhaps a show piece scene in the area you will be holding your party, such as corner of a large room. 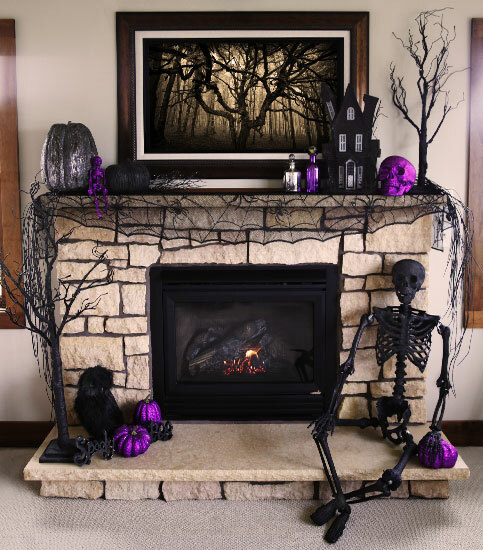 This Purple Glitter Mantle Scene is almost calm and peaceful, just stunning mix of high end Halloween decorations! It has a fantastic coordination of color and old school spookiness: a dark skeleton, cobwebs, owl, along with purple pumpkins and a glittery skull. Bring the celebration indoors without compromising your sense of style with this classic scene. Ideally this would look brilliant in a home with the open fire place or you could just alter it a touch and put it around a large sideboard. While all these scenes look amazing how they are setup, don’t forget to use your own imagination. Look at the image then stand back in your home and see if you can visualize where it would be a standout or how you could alter it slightly to add in as a feature somewhere. 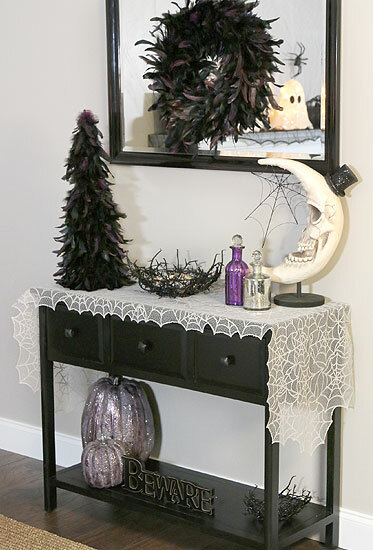 Glitter, feathers, and wreaths – these aren’t things that necessarily come to mind when you first think of Halloween. But with the right combination of items, you have a look that’s worthy of the haunting and mysterious holiday that is Halloween! Actually we wouldn’t mind having most of this display all year round it’s that good! It’s perfect for Halloween, of course, but just look at that feather tree! Gorgeous. And the matching wreath? Double gorgeous. We are also very fond of that skeleton moon… Even if you decide to take it down after the Halloween season, we know you’ll look forward to putting it up year after year, it’s just that nice! Again it’s all about using your own imagination but this scene would look out of sight in your entrance hall way. 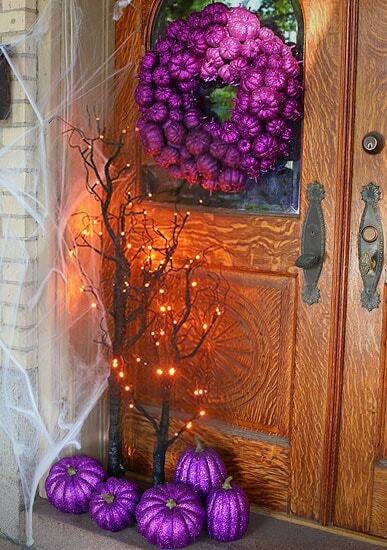 We hope you gained some great ideas to decorate outside and inside of your home. If you really want to go all out and push the limits add in some HALLOWEEN ANIMATRONICS as most if not all come with noise, which only adds to the effects you are trying to create! Full range of animotronics of course is at Halloween Costumes.